Coach of the Year? Sorry, not good enough. Earlier this year the NLL had a GM trading for himself, in what was likely a first in pro sports. In what might be another first, we now have the reigning Coach of the Year being fired by his team. Make no mistake: Troy Cordingley did not retire from coaching, he did not leave to take a different job or pursue other interests, it didn’t even sound like “a mutual decision for the benefit of the club”. He was fired. Although this is the first time in league history that the Les Bartley Award winner was fired, it will be the fourth time the Coach of the Year does not begin the next season with the same team. The first time was in 2001, the first year the award was presented. The inaugural winner was Philadelphia Wings head coach Tony Resch. Resch had just coached the Wings to their 6th Championship, and the retired from coaching a couple of months after receiving the award, and was replaced by Adam Mueller. Seven years later, Mueller won the award (which had been renamed the Les Bartley Award in 2004) with the New York Titans, and then he retired from coaching. The next time it happened, it was none other than Troy Cordingley at the other end of his Toronto Rock career. Cordingley won the Bartley award with the Calgary Roughnecks after leading them to the NLL Championship in 2009, and then left the Roughnecks in the offseason to join the Toronto Rock. So this is the first time this has happened in the NLL. But has it happened anywhere else? The only other similar situation I could find was in 2010, when the University of Maryland fired their football coach Ralph Friedgen after he won the Atlantic Coast Conference’s Coach of the Year award. As far as I could see, it has never happened in the NFL, NBA, NHL, or MLB. Update: It has happened before in a pro sport. Ted Nolan was fired as head coach of the Buffalo Sabres after winning the Jack Adams trophy for the 1996-1997 season. Thanks to @GlenMcDole for the correction. Anyway, enough history, back to the Rock. I have been called a Rock apologist and fanboy, and have been told that this blog focuses too much on the Rock, and perhaps that’s somewhat true. (Of course I’ve also been told that I’m not a real Rock fan because I said something negative about them, or picked them to lose a game, or something like that. I can’t win.) Well, I have no explanation for this particular move. Cordingley took the Rock to the Championship game in 2010, won it all in 2011, finished first in the division in 2012, and finished first overall in 2013. That sounds like four pretty successful seasons to me. Yes, the goal of every team is to win the Championship and they did that only once in that time. But they were a legitimate contender for the Championship in each of those seasons. Maybe that’s the problem – they were contenders every year but only won it all once. Perhaps I’m enough of a Toronto sports fan that I consider simply not sucking as a successful season, since that’s been true for the Leafs, Raptors, and Blue Jays for the last 20 years. But for Jamie Dawick and the rest of the Rock management, winning the Championship is the only measure of success – anything less is failure. Perhaps they looked at the last few years in a slightly different way – 2011: Championship. 2012: Lost in second round. 2013: Lost in first round. It’s obviously a small sample size, but they got booted from the playoffs earlier in each of the last two seasons. Something similar happened to Dave Pym (now a Rock scout) a couple of years ago. He coached the Roughnecks to three straight seasons of 10+ wins, finishing first overall in two of them, but because of their lack of post-season success (did not reach the finals in any of those years), Pym was fired. Pym’s regular season record as Roughnecks coach was 33-15, but the record that got him fired was the 1-3 in the post-season. Perhaps the Rock thought the same way – finishing first overall is great and all, but if you don’t win in the playoffs, it doesn’t matter. Personally, I am unconvinced that the two most recent post-season losses were enough to fire Cordingley. I’ve seen people calling it a stupid move and the dumbest move the Rock have made in years. That may be a bit strong, but if the entire decision rested on the loss to the Knighthawks in the 2nd round last year and the loss to the Swarm this year, I don’t think that’s enough. I’m not as angry as some others, but I am confused. Perhaps there’s more to this than has been announced. Interestingly, Terry Sanderson also “fired” himself as defensive coach. Is John Lovell as good a head coach as Troy Cordingley? Maybe, there’s no way to know yet. 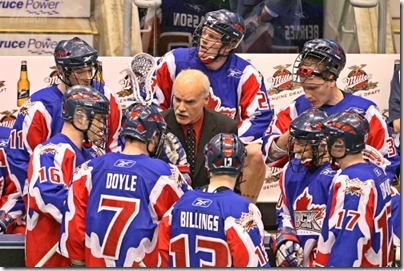 He has tons of lacrosse coaching experience, though none as a head coach at the NLL level. But he’s won Championships as an assistant coach, the players know him, and he’s well respected in the lacrosse community. But the team is replacing a man who’s won two Championships as a head coach and is one of only two men to win multiple Les Bartley Awards. And if a guy like that can’t keep his job after getting to the finals twice, winning once, and finishing first the other two years, Lovell’s got some awfully big shoes to fill. This entry was posted in Toronto Rock. Bookmark the permalink.